Mr Monkey spent a May Bank Holiday visiting the Derbyshire spa town of Buxton. 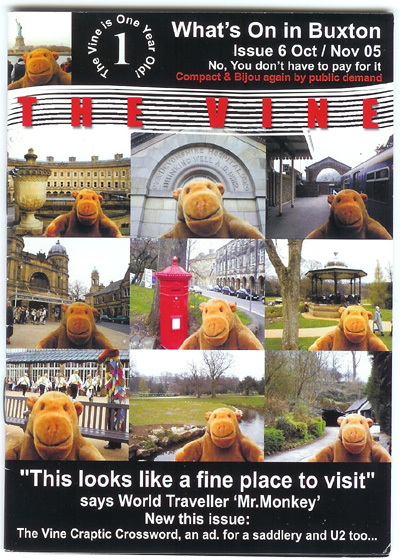 A while later, he received an email from the marketing manager of Pooles Cavern, asking if it was okay to use a couple of Mr Monkey's Buxton pictures in a listing magazine. Mr Monkey said yes, providing he was allowed to have a copy. To see the front cover in more detail, click on the second picture. You'll need to use the back button or the backspace key to get back here. 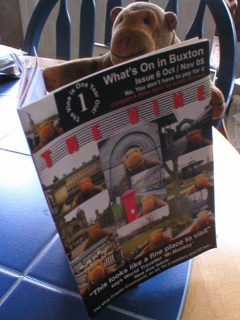 The Vine is available in and around Buxton, and has a website at www.buxtonvine.co.uk. 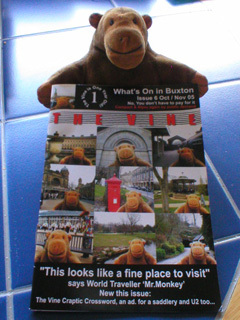 You can read all about Mr Monkey's visit to Buxton at Mr Monkey's Buxton Bank Holiday. * Well, apart from the masthead of the magazine. And one small picture of Mr Monkey in front of the Statue of Liberty, which wasn't in Buxton when Mr Monkey visited.